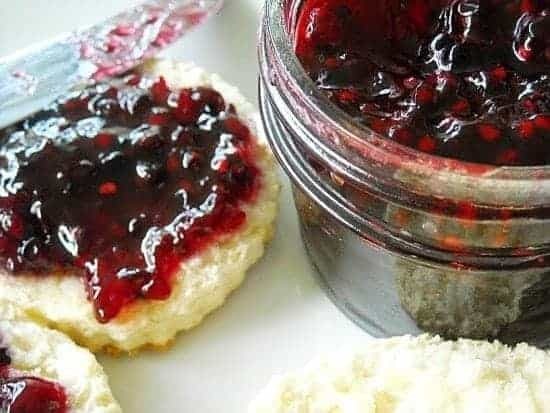 Last week, a friend called asking me to send her “That Recipe!” Of course I was puzzled, but it didn’t take long to figure out what she was talking about when she mentioned, “homemade Biscuits with freezer jam.” Apparently, I served that for breakfast the last time she visited. That Recipe is my Master Mix. The recipe below makes a lot, and keeps really well. Because it contains dry milk, all you add at baking time is water. And while it makes fabulous biscuits, it’s an all-purpose mix to make everything from dumplings to coffee cake and shortcake. 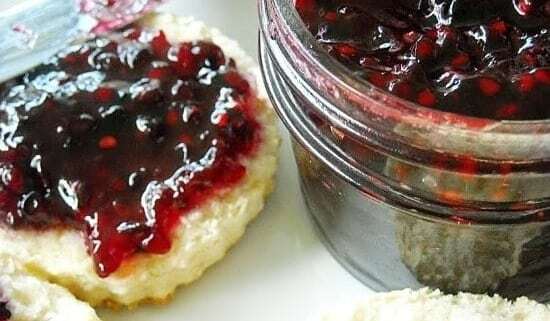 This mix makes a lovely addition to a Biscuits and Jam gift basket. Simply package a supply of Master Mix in a tightly covered container or bag, adding a tag that describes the contents. A nice idea would be to include the following options for how your recipient can use its contents. Your friend or loved one will probably appreciate the Master Mix recipe as well. Sift dry ingredients together. Cut in shortening until mix looks like cornmeal. Store at room temperature in a large sealable container like Tupperware. Makes 30 cups mix. Use within six months. FOUR DOZEN DROP COOKIES: 3 cups Master Mix, 1 cup sugar, 1 egg, 1/3 cup water, 1 teaspoon vanilla, 1/2 cup nuts or chocolate chips. Bake 10-12 minutes at 375 F.
NINE-INCH ROUND COFFEE CAKE: 3 cups Master Mix, 1/2 cup sugar, 1 egg, and 2/3 cup water. Blend all ingredients and pour into a greased 9-inch cake pan. Cover with topping: 1/2 cup brown sugar, 3 tablespoons butter, 1/2 teaspoon cinnamon. Optional: Add 1/2 cup nuts or raisins to the topping mix. Bake at 400 F for 25 minutes. EIGHT-INCH SQUARE GINGERBREAD: 2 cups Master Mix, 1/4 cup sugar, 1 egg, 1/2 cup water, 1/2 cup molasses, 1/2 teaspoon each cinnamon, ginger and ground cloves. Beat egg together with the water and molasses. Mix well with dry ingredients until all are incorporated. Pour into greased 8-inch square cake pan. Bake 40 minutes at 350 F.
EIGHT-INCH SQUARE CORNBREAD OR MUFFINS: 1 1/4 cups Master Mix, 3/4 cup cornmeal, 1 egg, 1 tablespoon sugar, 1/2 cup water. Mix all ingredients until fully incorporated. Pour into greased pan or muffin cups. Bake 25 minutes at 400 F.
Note: You can use Master Mix in any recipe calling for Bisquick, making sure you substitute water for milk if the recipe calls for milk, because you have already added the milk to the mix.